Spiritual Family: Where We Are the Church and Do the Bible. 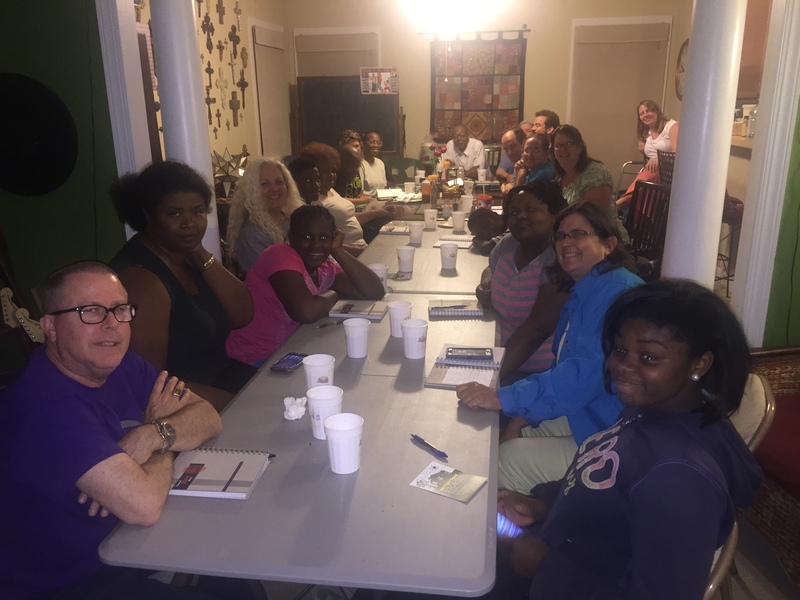 Posted: Tuesday, June 16, 2015 | Author: Marti (Michalec) Williams | Filed under: 2k15 | Tags: acts 2 church, family, missional community, Northside, RVA, Southern Barton Heights | Comments Off on Spiritual Family: Where We Are the Church and Do the Bible. I was reminded recently that I don’t write as much as I used to. Not sure why, really. Mostly because we are spending time doing life and not writing about it. I was encouraged to write more because people are watching us and are encouraged to live like us, as we attempt to live like Christ. So, I’m going to try and make writing a priority again. First topic – my Spiritual Family. Since Louis hasn’t been pastoring a traditional church since his time at New Hanover, people have wondered where we have attended church. Following 2 knee replacements and 1 hip replacement in 2013, in February 2014 – Louis, a few other friends, and I gathered to talk about what it would look like to start gathering weekly as an Acts 2 expression of the church, where are not simply going to church and reading the Bible. We ARE the church and we DO the Bible. 42 They devoted themselves to the apostles’ teaching and to fellowship, to the breaking of bread and to prayer. 43 Everyone was filled with awe at the many wonders and signs performed by the apostles. 44 All the believers were together and had everything in common. 45 They sold property and possessions to give to anyone who had need.46 Every day they continued to meet together in the temple courts. They broke bread in their homes and ate together with glad and sincere hearts, 47 praising God and enjoying the favor of all the people. And the Lord added to their number daily those who were being saved. Divine Truth – Where we are focused UP – our relationship with God the Father through Jesus Christ and in the power of the Holy Spirit. We are called to love God. The creator of the universe wants a relationship WITH US, and that’s pretty amazing. (vs 42) On Tuesday nights, we study God’s Word together – where everyone can offer what God says to them through the scripture. We rarely have traditional sermons. (vs 42 – they didn’t have Bibles back then, so they learned from Apostle’s teaching). Throughout the week, we are reading and discussing the Word with one another as we get together outside of Tuesday nights. Each Tuesday and the rest of the week, we are in prayer for and with one another and our neighborhood and city. Nurturing Relationships – Where we are focused on being IN relationship with others. We are called to love our neighbor as ourselves. So, we focus on building relationship with one another…encouraging and loving in a familial kind of way. On Tuesday nights, we gather around the table to eat, laugh, eat, talk and eat, but also sharing life throughout the rest of the week – in person, via text, phone calls, etc. – (vs 46). We have traveled with one as he spent 4 months in jail and welcomed his mom and family into ours. We have cried together as family members have passed away and diagnosed with cancer, dementia, and more. We remind one another of the TRUTH and not the lies of the deceiver. We have celebrated marriages, new jobs, and new schools together. We like to party! We sent one to the military and another one on the road for a job. We have pooled our resources to repair homes, yards and cars. We have found new homes for washers, dryers and more! They will know we are followers of Jesus by our love for one another. Apostolic Mission – Where we are focused on going OUT into the community in our everyday walk around lives. We aren’t meant to be in a holy huddle sequestered away from everyone else. But, called to be in, but not of the world. Sometimes we do this as a group – like at our annual Memorial Day cookout or last year’s National Night Out in Highland Park where we set up a prayer tent. Today, it happened to be with my friend Karen who lives a few blocks away. We ate lunch at a new restaurant on Brookland Park Boulevard getting to know the owner and other employees. We bought and moved a piece of furniture from another neighbor who is moving because his wife had just died of cancer. We encouraged him and prayed for him. I got to meet 2 of her neighbors – 2 young men who said they wanted to come Tuesday night. Karen used her arboring skills to teach me how to trim a bradford pear tree beside the house. And the evening ended with passing on 5 white polo shirts to a neighbor who is starting a new job tomorrow. (Special thanks to friends who lovingly donated them!!!) So, as you can see… this isn’t a project or a specific thing we did. It was in the everyday rhythms of life that we were OUT and about looking for opportunities to love and serve. People aren’t projects. No one wants to be someone’s project. We just love people where they are. Beyond – Prepare and Equip – We spend our time preparing and equipping others to live a life following Jesus on His mission, who will then prepare and equip others to do the same. We aren’t meant to do life alone, but are meant to do so with others BEYOND ourselves. I can’t imagine life without this spiritual family, which is growing weekly (vs 47) and we are seeing lives transformed (vs.43). All are welcome to the table. We are quite a motley crew, but this crew loves one another…warts and all. Our Back Yard… Memorial Day… This Monday… Be There! 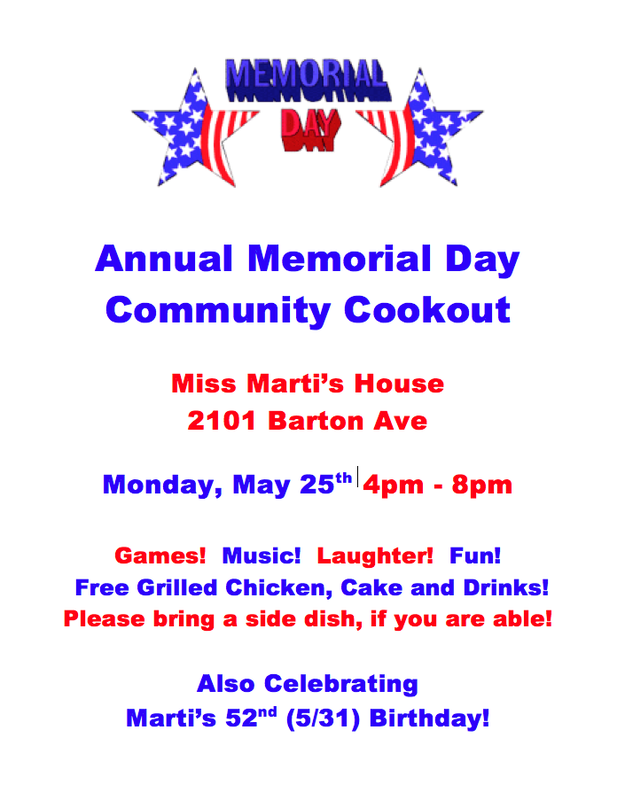 Posted: Wednesday, May 20, 2015 | Author: Marti (Michalec) Williams | Filed under: 2k15 | Tags: community cookout, Memorial Day, Northside, RVA, Southern Barton Heights | Comments Off on Our Back Yard… Memorial Day… This Monday… Be There! One of favorite gatherings!!! Every year on Memorial Day you can find folks gathered in the backyard… eating, playing games, eating, laughing, eating, talking, and eating! So, grab a covered dish (with some food in it!!!) and come on over! We supply the meat (chicken), drinks and dessert… you supply the rest… veggies, chips, bread, salads, fruit, beans, etc. Please note: There is NO rain date for this event. But, the weather is looking GREAT! Last year, we started a new tradition. 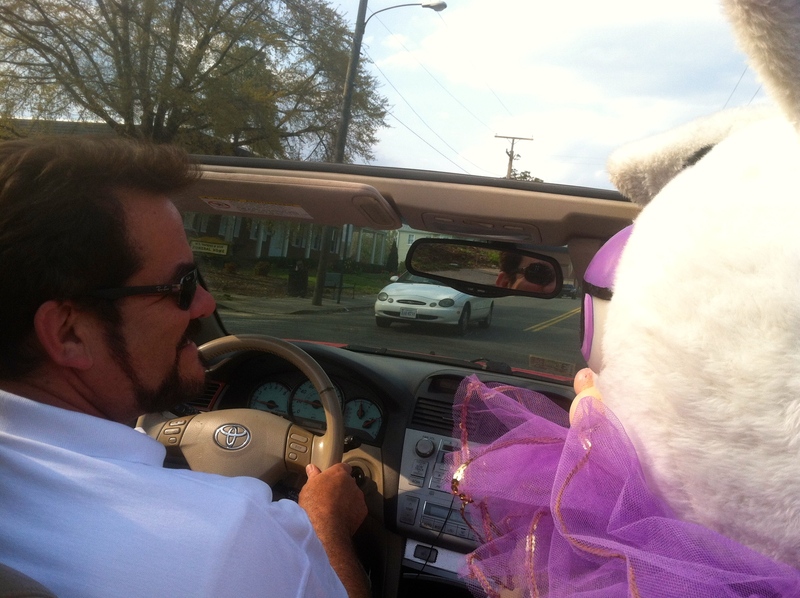 We call it Drive-by Joy, where we drive around with the Easter Bunny spreading Easter Joy! This takes an OBSCENE amount of candy! But, sooo worth it! We are grateful for the many people who supported us with gas money and candy! And I have already received the first 2 bags of candy yesterday! WOO HOO! Stocking Up! For 5 years we have held an Easter Party including an Egg Hunt, Resurrection StoryTime, Games and more! We love it! Invitation is below. 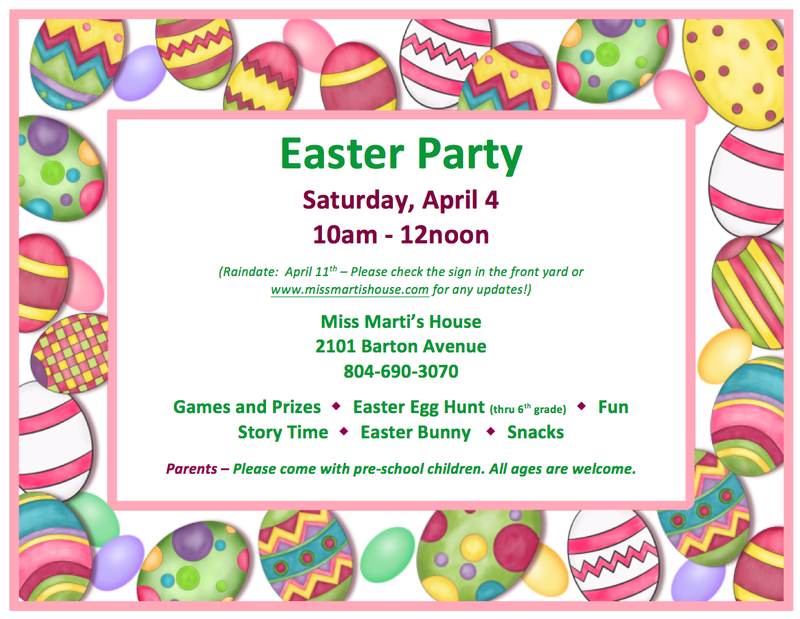 2013 – Candy, Bunny and Eggs…Oh My! Hope to see some of my old friends and meet some new ones, too! BIG THANKS for Supporting Mardi Bras RVA!! 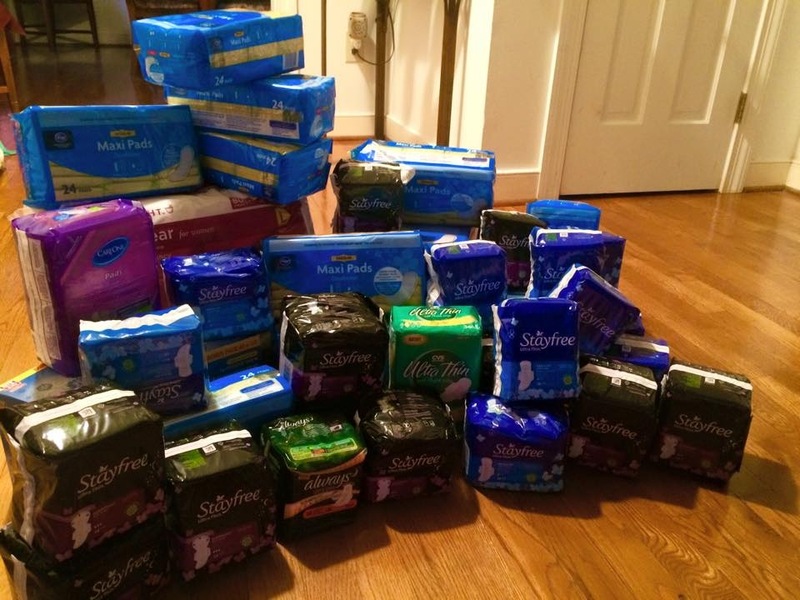 Posted: Saturday, March 7, 2015 | Author: Marti (Michalec) Williams | Filed under: 2k15 | Tags: donations, feminine protection, homeless, Mardi Gras, RVA, women | Comments Off on BIG THANKS for Supporting Mardi Bras RVA!! So. You WERE invited to come and share in the presentation of the award presented by 2 City Council Members – Chris Hilbert and Ellen Robertson. And I totally got the date wrong. Totally my mistake. Totally an opportunity to keep me humble. 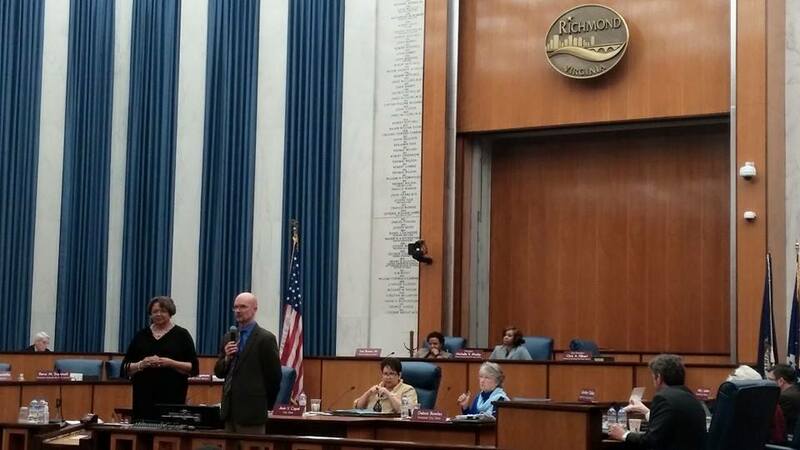 Here is a picture my friend Valena Dixon took of them presenting the award…. and none of us were there. I am sad. I’m somewhat embarrassed. I’m beyond grateful to Ellen and Chris (and Lisa!!!!!) for honoring my work in such an awesome way. I apologize to them and the rest of council …and YOU… for getting it wrong. I really appreciate those who were planning to come. As soon as I get the certificate, I will post a picture for all to see! Because like I said below – YOU made this happen. I just connected you to the need. WOW!!! 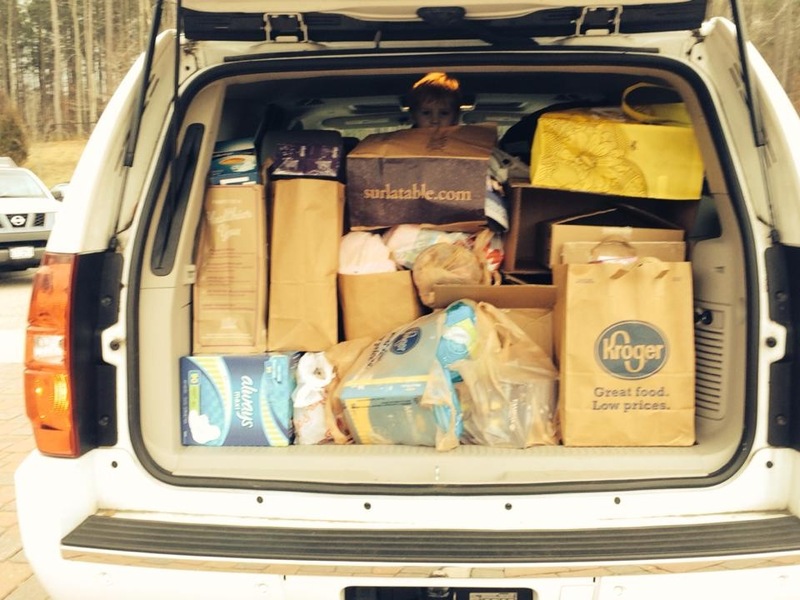 I am still blown away by how you all have given so abundantly and extravagantly! We received “party favors” (as Louis began to call them!) from Dinwiddie, Chesterfield, Hanover, Henrico, Goochland, Richmond City, Petersburg, and even Norfolk!!! This was true regional cooperation! And we are grateful. Praise God for your generosity! Last week,we received a call sharing that I (Marti) will be recognized by Richmond City Council for my work in the city; and I want YOU there, too! If you had any part in Mardi Bras RVA, please come! YOU made this happen! I just connected you to the need… and YOU made it happen!! DATE: Monday, March 16th 9th at 6pm Note: Recognitions happen at the beginning of the meeting, so you won’t have to stay long! And I will have a few minutes to share! Pray for me! 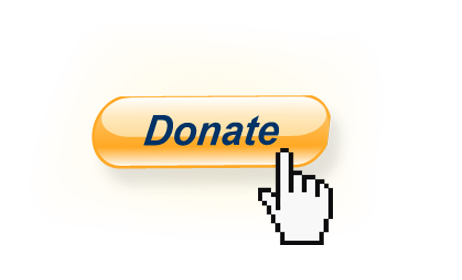 Because you gave, we have been able to assist women in transition, women who are homeless, women who have low or restricted income! 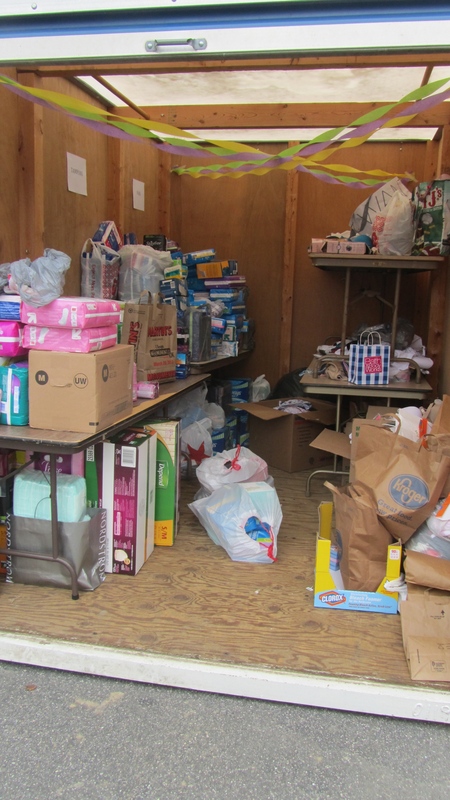 You gave to women through the following ministries, agencies, non-profits and churches. Although we are no longer accepting donations and are working to empty the PODS, you can contribute directly to one or more of these organizations! True change and transformation happens through relationships! Please build relationships with one or more of these groups! I encourage you to get connected and stay connected. Richmond City Justice Center (aka – the new city jail) REMEMBER – undergarments must be white and wireless! In addition to giving to many women, I am THRILLED that so many diverse people from various parts of Metro RVA were connected. God wants us to take our gifts and use them to HIS glory. For me, that’s taking my gift of hospitality and love of fellowship, my gift of connectedness and love for people, and my gifts of arranging and believing to help unleash YOU around a common cause. Thank YOU for saying YES! My cup continues to overflow as I share your YES with the direct service providers (in between all these snowstorms!) One more week to unload the PODS! Pray it doesn’t snow…again. Here are a few pictures of the 2 gatherings… Enjoy! Mardi Bras RVA supplies are coming in every day! Keep ’em coming! Top 10 Posts in the Last 5 Years! Posted: Tuesday, February 17, 2015 | Author: Marti (Michalec) Williams | Filed under: 2k12 | Comments Off on Top 10 Posts in the Last 5 Years! Today is the 5 year anniversary of my very first blog post! It started as a lenten project. Many people had encouraged me to tell my story… of how I moved “Into The Neighborhood” and how I met the “other half of my pair”. So…this is how it started..with this post… why blog? and in the beginning, where I told the story over the Lenten season in the spring of 2010. If you want to read my story from the beginning, start there and work your way backwards. Of if you want to jump around over the last 5 years, you have read about things like… How Louis and I met, Camp Splash, Easter Egg Hunts, Halloween, my 50th Birthday, Community Cookouts, Living on Mission, and more! Since then…it’s been hit or miss. I’ve been busy living life more than writing about it. It’s come in spits and sputters, as i write sporadically. I just want to say thanks for reading. And special thanks to those who share how my writing… my God-inspired true life stories… help shape your life. Thanks a lot. Heart Breaking. Soul Weeping. Mind Reeling. Knees Bending. 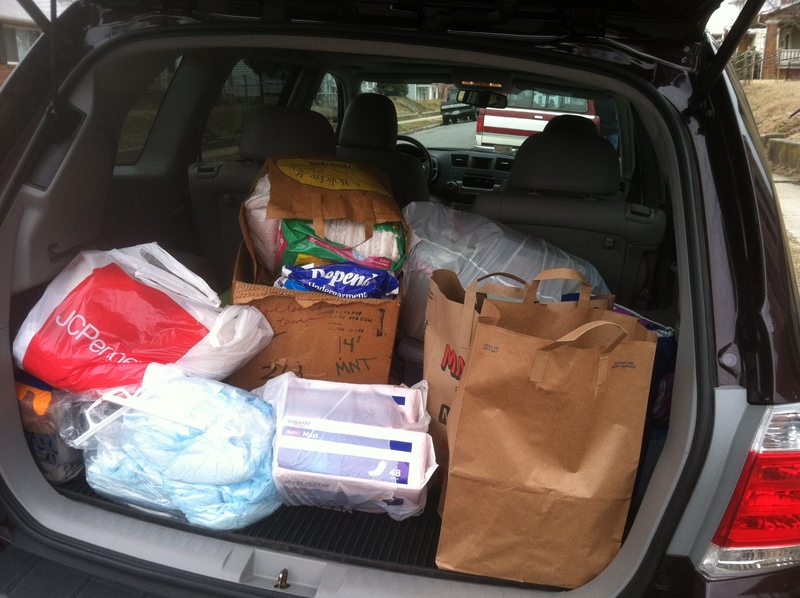 I am overwhelmed at the generosity of each and every one of you! Seriously! This started out as a quick invitation to some friends, that has now exploded into a full movement! And… I couldn’t be more thrilled! Seriously! Even with the postponement due to the pending storm, I couldn’t be happier. WHY????? Because it gives us an extra week to tell more people and collect more bras, underwear, pads, tampons and such! WOO HOO!!! Please help spread the word by forwarding this message to them! 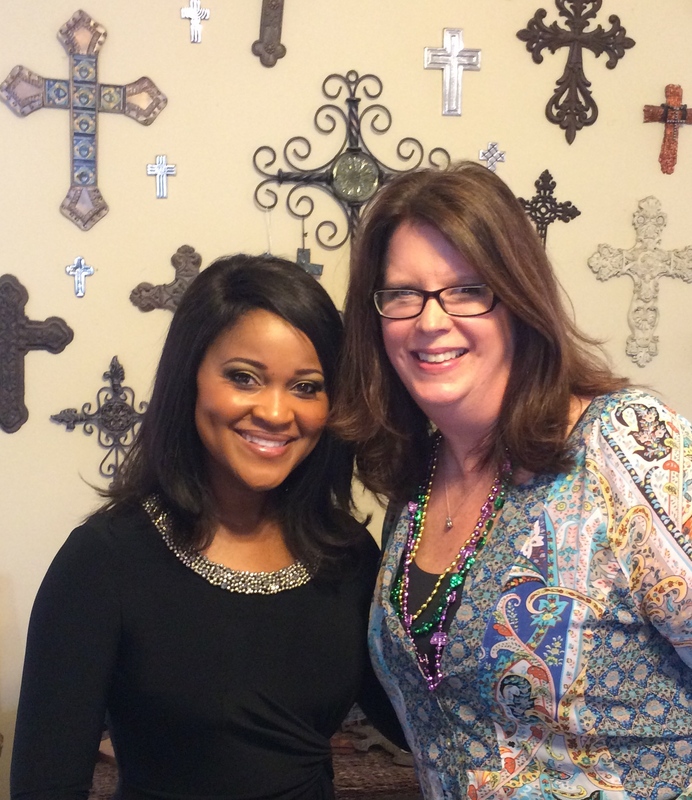 If you missed her Focus on Faith Segment on Wednesday, 2/4, you can see it here – NBC12 Interview and Video. Karla and Matt (camera guy) were amazing and fun! So appreciate them! Due to the pending snowstorm, we have rescheduled for next week! Underwear – all shapes, all sizes. Don’t forget larger sizes! Need solid white for Richmond City Justice Center. Other colors are good for other ministries. Bras – all shapes, all sizes. Don’t forget larger sizes! Need solid white and NO WIRES!!! for Richmond City Justice Center. Other colors are good for other ministries. We are thankful for these gifts and contributions: A real answer to prayer!!! GFC Catering for catering both gatherings. The Cake Lady – for supplying beautiful cakes for both gatherings! Check back often because we will update the list! And need your help filling it up! 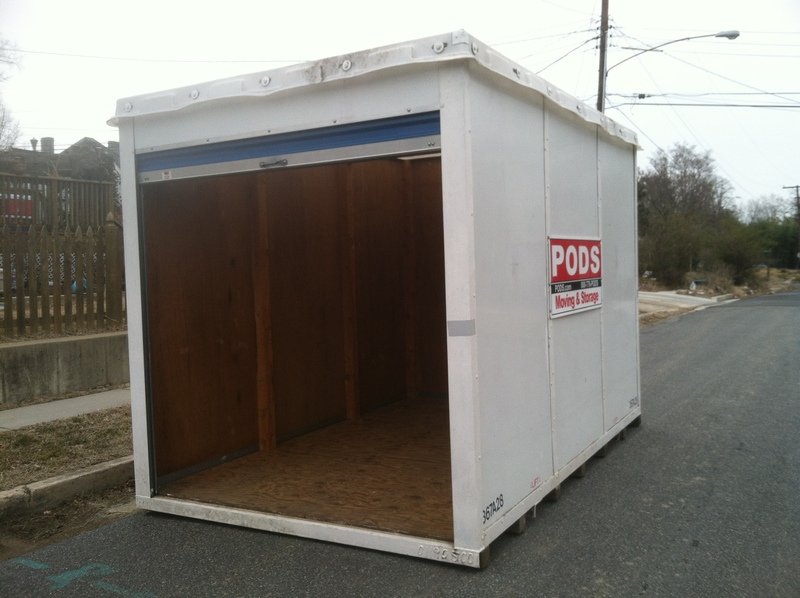 We are so grateful to PODS for the generous gift to us! 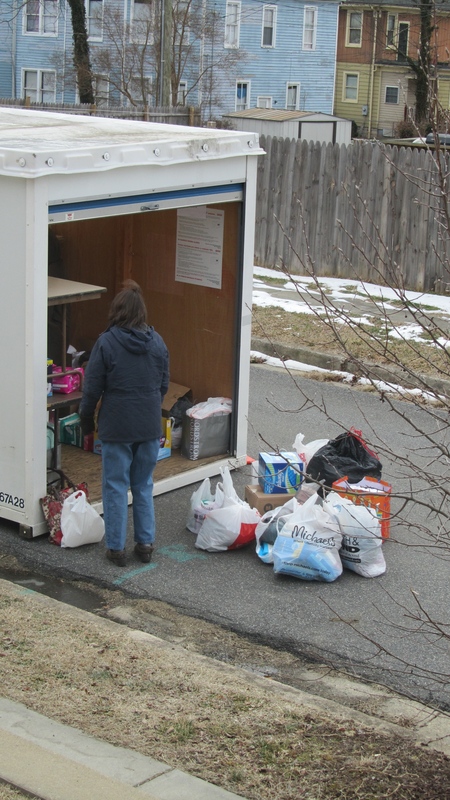 We have it temporarily to collect, sort and store all of your donations! WHAT A BLESSING! Hope to see you in a week! for it is more blessed to give than receive. To my single friends on Valentine’s Day, especially the women who longingly desire to be in a relationship…to be married. You know who you are. I see you. I hear you. We have chatted and cried together. We pray for that “special one” without ceasing. I understand. I was single, never married and lived alone until I was 45, when I married the “other half of my pair”. I see you. And I love you. More importantly, THE LORD SEES YOU!!! You are loved with an everlasting love. But – to keep it real – that just doesn’t feel like enough sometimes. (Although it should – and then you feel guilty about it because it should and it doesn’t. Vicious cycle!!!) I’m not going to preach. Promise. I just want to share a few things. I get that this can be the hardest day of the year for many of you. Today and wedding days. When you are thinking “Phew. Lord Jesus. Help me get through this day without punching someone.” You will be barraged with pictures of your friends and their spouses and boy/girlfriends receiving heart-shaped pancakes, balloons, and cookies, along with that box of chocolates and a gift certificate for a massage. You will read posts that ooze of sweet-nothing’s. You will see pictures of scrumptious food being served by candlelight in a lovely restaurant, unless he takes her to the candlelight dinner at Waffle House (yes… true story this year!!!) And I am sorry for the pain this may give you, as you long for Cupid to fly his arrow in your direction. I see you, and I hear your pain. Please – let me remind you – this is but one day out of 365. For many of these couples, the other 364 is a real struggle. For many couples, it’s a chance to play the ‘happy, loving couple’ for one day out of a year. Please don’t see the ‘fairy tale romance’ played out on Facebook, Instagram and Twitter as reality. There is NO knight-in-shining-armor riding up on a beautiful horse. The struggle is real. I am reminded of what Gary Thomas writes – What if being married was more about making you holy than making you happy. For me, a truer statement has never been uttered. When I was single and first read his book, Sacred Marriage, that line bounced off the page and hit me straight against my forehead. I even changed it to – what if relationships (as a whole) were designed to make you holy more than happy. I thought of many relationships that were challenging to me at that time. And then I thought – a lack of that special relationship was more about making me holy than making me happy. And then, I would remember His Promise…that all things work together for my good….as I struggled to trust God and his timing. If I went with my timing, I might very likely be married to a drug and alcohol addicted, neglectful husband with 13 kids hanging outside of a trailer. All of that to say. I see you. And I think of and pray for you on days like today. You are loved. You are seen.